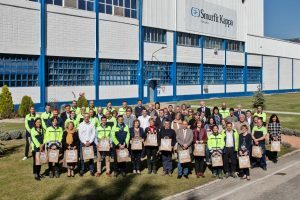 Paper-based packaging provider Smurfit Kappa is celebrating the first annual European Paper Bag day at its Sangüesa Paper Mill in Spain, to promote the use of paper carrier bags as an alternative to plastic bags. The milestone day was created by “The Paper Bag” platform, Europe’s leading association for kraft paper manufacturers and paper bag producers, to educate consumers about the benefits of opting for paper carrier bags. Less than 1 per cent of the plastic bags used every year are recycled. Smurfit Kappa drew on its high quality paper portfolio to produce an efficient alternative for paper bag producers which is strong, performs well in wet conditions and is safe for food contact. To mark European Paper Bag day, the Sangüesa mill cooperated with the Navarra Government by supplying the paper to produce 130,000 paper bags for distribution through local shops, supermarkets and consumers across the Navarra region. Isabel Elizalde, Navarra’s Regional Minister for the Environment, supported the occasion and was given a tour of the mill. 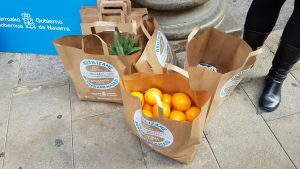 She also delivered the paper bags to local shops in Sangüesa and encouraged customers to test them as a sustainable alternative for transporting their groceries. Laurent Sellier, COO Smurfit Kappa Paper Europe, said: “We’re delighted to have collaborated with the Navarra Government to support European Paper Bag day as part of our wider initiative, Better Planet Packaging.